How much space expertise does NASA need in its top office to launch humans safely into space? NASA administrator Jim Bridenstine is a former lawmaker, and he says he wants a former astronaut, Dr. Janet Kavandi, as his deputy. But Donald Trump, who makes the final decision, is leaning toward a man with no experience in space technology. Five sources with knowledge of the deliberations tell Quartz that the White House is seriously considering James Morhard, a veteran senate aide. Their names have been withheld because they are not authorized to discuss the decision, but they worry that the wrong person in that job could create new problems for NASA. The agency is preparing to authorize private spacecraft built by Boeing and SpaceX to carry astronauts to the International Space Station in 2019—the first launch of astronauts from US soil since 2011. “The President selects the highest caliber of individuals from an array of backgrounds and experiences to fill positions in his Administration,” White House spokesperson Lindsay Walters said in a statement responding to questions about the deputy NASA administrator role. 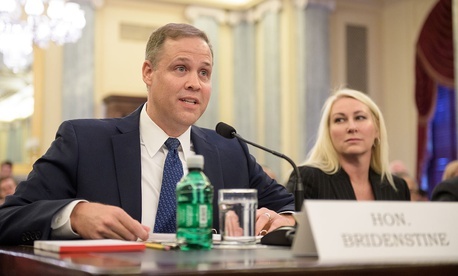 During testy Senate confirmation hearings, Bridenstine reminded senators charged with approving him that previous administrators, including iconic leader James Webb, came from non-technical backgrounds. But the former lawmaker and fighter pilot promised that he would seek an experienced technologist for his leadership team if confirmed. Presidents often balance NASA leadership between those who navigate political battles, and less partisan figures with space exploration experience. During the Obama administration, former astronaut Charles Bolden led the agency, while Lori Garver, a space expert who been a senior advisor at NASA during the Clinton administration, was his deputy. Before that, NASA administrator Michael Griffin, an aerospace engineering expert, was back-stopped by Shana Dale, an attorney who had worked in the Bush White House and Congress. Bridenstine is seeking similar balance for his own political background: In June, he said Kavandi would make an excellent deputy administrator.“That’s the kind of person at this juncture, given how important everything is right now, that we need as our deputy, and I’m advocating for her,” Bridenstine said. Kavandi, 58, joined NASA’s astronaut corps in 1994. She had previously been an engineer at Boeing, and earned a P.h.D in analytical chemistry from the University of Washington in Seattle. She spent 33 days in space as an astronaut on three different space shuttle missions, then became the lead astronaut supervising work on the International Space Station and the deputy head of the astronaut office. In 2016, she became the director of NASA’s Glenn Research Center, which includes a huge vacuum chamber where SpaceX’s crew vehicle, the Dragon space capsule, is currently undergoing tests. “While the President has not yet nominated a deputy administrator for the Agency, Dr. Kavandi is honored that the NASA Administrator expressed his confidence in her,” a spokesperson for Kavandi told Quartz. In his current job, Morhard, 61, is responsible for technology and administration in the offices of 100 senators and 88 committees and subcommittees. Starting off as an accountant at the Pentagon, he began his career as a legislative staffer in 1983, earning an MBA and a law degree along the way. He rose to become the powerful chief of staff of the Appropriations Committee under the late senator Ted Stevens, and forged close ties with Republican senators. Morhard was a passenger, along with former NASA administrator Sean O’Keefe, in a 2010 plane crash that killed Stevens and four others. He did not return a message left at his office. One NASA official who spoke about the nomination with Quartz worried that Morhard lacks sufficient engineering experience to justify his nomination alongside Bridenstine, particularly on technical questions where NASA headquarters will need to play referee between competing teams of engineers. Boeing and SpaceX are the first companies to build human-rated spacecraft as a fixed-price commercial service for NASA, rather than executing NASA designs under a cost-plus contract. As a lawmaker, Bridenstine was a major proponent of these partnerships, citing SpaceX and Orbital ATK’s successful work carrying cargo to the International Space Station. But flying humans into space is a whole new level of danger. NASA’s engineers have pushed both companies to meet a safety threshold more than twice as high as that of the Space Shuttle. That metric, known as loss of crew, is expressed as a probability of 1 in 270; the Space Shuttle at its best had a 1 in 90 chance of loss of crew. Despite their efforts, neither Boeing nor SpaceX appears likely to meet the standard, though they will both field vehicles considered safer than the shuttle. The biggest problem for both companies is the constant danger of micrometeoroids in orbit, though each is working to resolve specific concerns NASA engineers have with their vehicle designs. NASA is preparing to okay flights below the targeted standard because it simply may be impossible to reach; as Kathy Leuders, the commercial crew program manager, told me last year, “you have goals, and then you have engineering reality.” NASA is doing other work to help mitigate these risks, like installing high-definition cameras on the ISS to inspect spacecraft for any problems on-orbit. Bill Gerstenmaier, the NASA executive in charge of human exploration and operations, has written eloquently about the need for NASA to acknowledge that risk is central to space exploration. The final decision to put astronauts on these rockets will come to Bridenstine’s desk. In the past, the disconnect between headquarters decision-makers and engineers on the ground was linked to disasters like the lost Challenger in 1986 and Columbia in 2003. So the rest of NASA is watching closely to see who Bridenstine’s deputy will be.